living in a very different habitat, but also they are very far away from big cities of developed world which the most contribute to pollutions and environmental change affecting those delicate animals. The project highlights the importance of corals to communities and marine biodiversity around the world and their struggle in our ever warming seas. Coral bleaching is an unwanted natural phenomenon stimulated by global warming, according to research, since 1955 approximately 90% of excess heat trapped by greenhouse gases has been stored in the oceans, causes a steady rise in average temperature by 1.0 C since 1950s. Heightened temperatures cause the symbiotic relationship between the algae that live in coral to breakdown, changing the colour and most significantly causing the coral to be unable to feed, if corals are bleached for too long they will die. 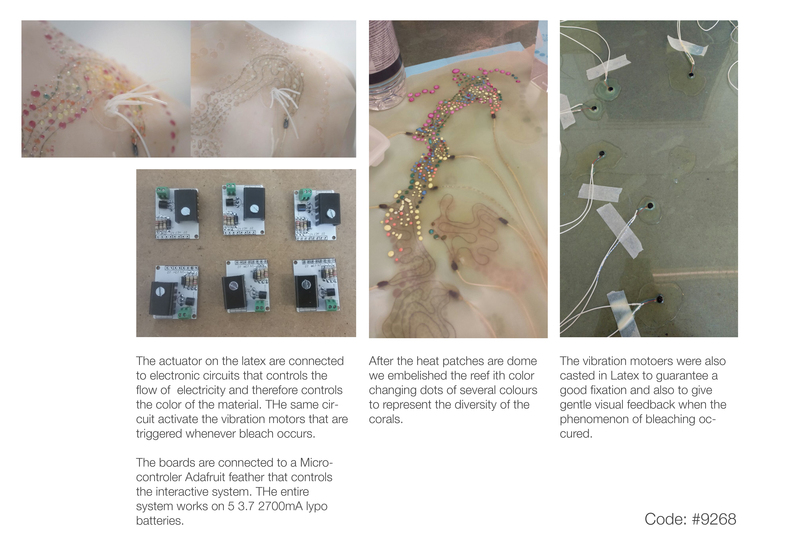 informing the viewer by changing the pattern of the wearable from color to transparent and felt by a wearer thanks to vibrations from tiny motors embedded in the wearable. except for the latex membrane that looks very much like a ‘second skin’. 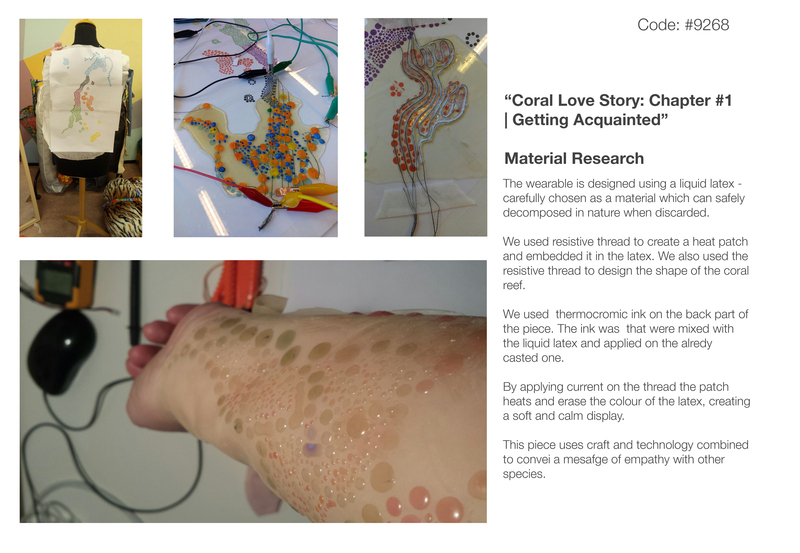 The latex is embedded with conductive thread and implanted with colourful thermochromic ink in the shape of the Great Barrier Reef allowing the suit to react to received data by altering its colour opacity. Areas of the pattern fade from view becoming transparent and correspond to real-time ‘coral death events’ mirroring the bleaching that occurs when corals are dying. The dancer chosen by the artist to perform in Coral Love Story is deliberately androgynous in appearance reflecting the fact that many corals are hermaphrodite. Furthermore, tiny vibration motors embedded within the latex membrane, allow the dancer to actually feel the information received. The vibrations also cause tentacles, protruding from the surface of the latex skin, to convulse. The data feed for the wearable from the Great Barrier Reef comes via the National Oceanic and Atmospheric Administration (NOAA) and is enabled by 3G connection to an adafruit feather micro-controller embedded within the latex that actuates the colour change and vibration.